I did some digging following all of the brouhaha concerning the Trackman supposedly clocking Tiger Woods’ club speed at 129.2 mph on Saturday with his 14th hole drive. As I expected, the evidence of a mis-read by Trackman far outweighs any possibility that Tiger got anywhere close to that speed, and that’s not to slam TW! I don’t get it – a 42 year old pro with back fusion surgery hitting 120+ mph club speed is amazing, and there’s no need to try to fluff that kind of number. From what I’ve been reading, there are two things to take into account – first, that the Trackman ball speed is measured by radar and is very accurate – radar is the best way we have of tracking moving objects, so you can’t really fault the ball speed numbers. I’ll show you something regarding TW’s ball speed numbers that should show how consistent his ball speed readings have been, and that something is out of whack with the club speeds. Jeffrey Pierce is a PGA Tour instructor & Director of Instruction at The Club at Olde Stone and I’ll just defer to his expertise with Trackman systems, if you all don’t mind. So, you see here, it’s not just Tiger Woods, but any player using a TM composite club head driver is going to cause issues for the current PGA Tour launch monitor, the Trackman3 – of course, they aren’t going to advertise this. That was the source of my annoyance – the pundits and analysts are surely more plugged into the pro golf scene than I am (Peter Kostis even says in his Tweet that he’s doubted TM CHS numbers for some time), so I wondered why others were so enthusiastically hyping an obvious mis-read. Well, no, I didn’t wonder – it’s the hype, but it was still annoying to people who try to live in a world based on reality. What I see is a remarkable consistency in ball speed numbers at around 181 mph, and with a Smash Factor of, say, 1.49 for solid strikes (and you’re striking the ball nearly identically to produce nearly identical ball speed numbers, which indicates a very consistent ball-striking pattern), you’re looking at around 121.5 mph in club speed. So, this is why I was put off by the commotion with regards to a reading of 129.2 mph for someone averaging 122 mph and if you look above at Tiger’s ball speed of 182.3 mph for that drive, a Smash of 1.49 would have given him 122.35 mph in club speed. 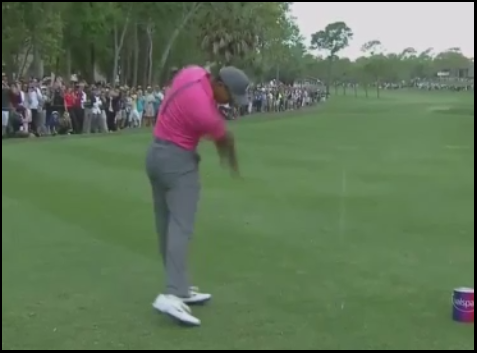 A – Tiger swung at 129 mph? B – Mis-read, and likely around 122 mph? I know which one I’d be putting all my chips on! And don’t let the hype machine fool you – I would bet you that nearly every person jumping up and down and screaming “129.2! !” who is involved in pro golf would be betting on B as well, which made the whole cynical display… exactly that. My proof? 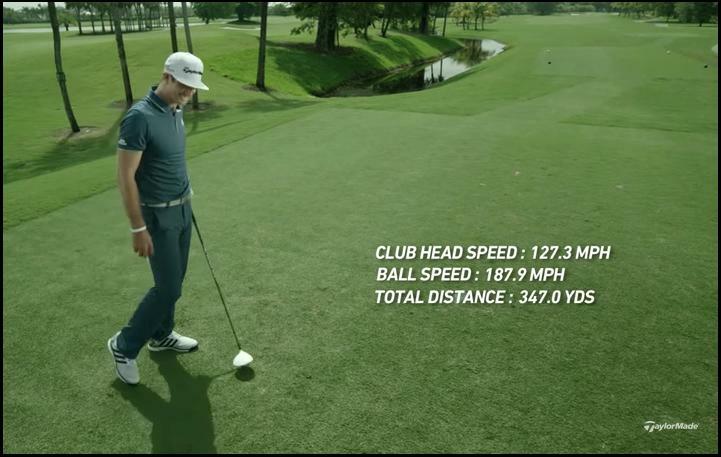 I have none, of course, but the telling evidence to suggest cynical hype is that the PGA Tour and telecast stations such as Golf Channel, CBS and NBC have been giving ball speed numbers all season, but the PGA Tour chose to tout TW’s club speed for that drive in their Tweet, with nothing said about the ball speed. Now, why do you think they’d have done that, especially knowing about the Trackman3’s issues with CHS readings? As I said before, it does everyone a disservice, because less knowledgeable folks who were so impressed by 129.2 will now yawn at TW’s actual CHS numbers of 120-122 mph, which are still eye-opening for a 42 year old pro coming off four back surgeries. A shame, because I am still shaking my head that he’s back above 120 mph! … will be pretty bang on the money when it comes to ball speed, with issues on club speed (the SSR because it’s measuring object speed and the toe on a released club head will be travelling faster than the middle and heel, when you want the speed of the center of the club), which is why you should always go by the ball speed metric to gauge how fast you’re swinging and how solidly you’re hitting it. So, with the 187 mph reading I got on the drive in the above gif., and giving me a perfect Smash of 1.50, my minimum club speed for that swing would have been 124.7 mph – so with a slightly less than perfect Smash, you’re looking at a likely 125-127 mph club speed for my swing. I would likely get higher ball speed readings with the ultra-modern and custom-fitted clubs and balls that the pros have access to, as my reading was with a Ben Hogan C73 driver and not-so-new range balls, but there it is – the radar doesn’t lie when it comes to ball speeds. This entry was posted in Ball Speed, Club Head Speed, PGA Tour, Swing Speed, Tiger Woods and tagged Ball Speed, Club Head Speed, DJ Watts, PGA Tour, Tiger Woods, Trackman, WAX Golf on March 13, 2018 by D Watts. PK has a Foresight Quad like mine so he understands the shortcomings of Trackman. Trackman never sees the face of the club so can not accurately judge the “moment of touch” to give you the club speed data or smash factor. Both units do a great job at ball speed though, Foresight with 4 high speed cameras and Trackman with the doppler radar. It will be fun to get you on the Quad to get your numbers. I know what they will be because of personal experience at our summits but having concrete numbers will validate all of your MCS work. Many of us didn’t need validation with our own experiences. I have a match today but will get some pictures to you. It is every golfers dream. I was hitting balls last night at midnight. I have never been so pleased with my swing as I am right now. I still struggle with the stable left foot but it is coming. Years of loading up that right foot are hard to break when playing. The pressure plate should be so easy but at 66 I guess it isn’t 🙂 Talk soon.